It’s a strange thing, blogging about menswear. At least to me. I get easily bored, so I’m always keeping an eye out for things that are new and interesting, both for my own interest, but also because a menswear blog that is always writing about the same thing quickly gets a bit boring. That is also a thing, as to be brutally honest, most menswear is fundamentally the same. It’s the basics, designs tweaked, different fabric choices, but really much of the same, most of the time. Don’t get me wrong, I find things that have enough added different to interest me, but rarely does something come along that makes my teeth sweat. Imagine the level of ping my sonar made when I discovered there was a new outerwear brand in Norway, and not only that but the HQ was in Oslo and their coats were definitely in the high-end range! This had to be investigated, and I’ll freely admit I trotted off to meet them with a serious level of interest. The question was obvious: How can a new brand come along, make cocky claims and ask a fat stack for their wares? Wearing the Serac T2 Hybrid in Norwegian winter conditions. This turned out to be an afternoon of surprises. Tore, the man behind Serac, turned out to be humble, softly spoken, and as far from a shiny-suited salesman as you can get. His background is in industrial design, both in furniture and more recently as a senior designer of outerwear at Helly Hansen. He wanted to explore the design of outerwear and asked himself what could be created if there were to be no limitations of fabric, construction and price. And so the no-compromise Serac coats were born. Talking to people with a genuine enthusiasm for what they’re doing is both fun and inspiring. Hearing Tore explaining the details and mindset behind his first range of three coats was invigorating. A Serac coat takes 8 hours to make, whereas an average coat will take 4 hours. The coats are manufactured at a high-end factory in Italia that also makes for brands such as Belstaff and Burberry. The British Millerain Staywax 3-layer technical dry wax fabric adds cost but is the best for the task. The technical Primaloft Gold insulation is the best available. The sheepskin and visible and invisible details add to it. At the end of the day, it all results in the current retail price. The idea of sustainability was also honest, in that realistically speaking you can’t make a jacket that is without environmental impact, but you can make a jacket that lasts so long that in sum it will have less impact on the environment than a number of lesser jackets being used and discarded over the same period of time. A side by side comparison of the Serac T2 Hybrid and a vintage Swedish army M1909 extreme winter parka. The most obvious point you notice is the large sheepskin collar. This can be worn flat or folded up for extra protection. To me the collar is a clear reference back to one of the legends of winter coats, the Swedish army M1909 parka, often known as the “livpäls” or “Mats Larson” (references to that it has waist-length fur and to one of the makers contracted to produce them). The same goes for the large, usable front pockets. The T2 coat has a combination of two outer fabrics, the dry wax three layer British Millerain Staywax and Italian wool on the lower part. The waxed upper should over time develop character similar to an old Barbour, while the addition of the contrasting wool really makes the outer come to life. The fabrics are all black though, so we’re talking stealthy street ninja here, not a “look at me!” coat. The British Millerain dry wax fabric and wool outer. The secret zippered pocket is just visible. An example of the thought that has gone into the details are the snap buttons on the pockets. In my experience, these can often be tricky to close, especially one-handed. Either you’re pressing the button into your body or you have to use both hands and fold the fabric to close it. Here there is provision to put a finger behind the rear button piece, so you can easily close it one-handed. Once you’ve done this a few times it comes naturally and you then wonder why others haven’t thought of it. Clever feature on the Serac T2 Hybrid to allow easy close of snap buttons. There are 8 pockets available. Three on each side of the front: The big lower front pockets, two zipped, hidden pockets above them and two chest pockets. 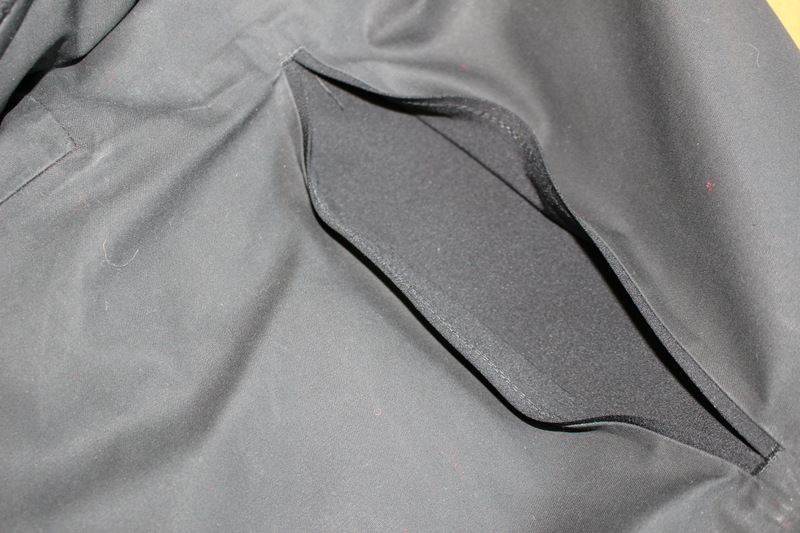 On the inside, there is a zipped pocket for valuables and a pocket made large enough to store a full-size iPad safely. The big pockets are all in the wool fabric and the tactile sense of this is wonderful. The zipped pockets inside the big pockets are genius though, as with they are both sizable and zippered. Great for keeping a phone, wallet and suchlike, while not visible to anyone that might be curious about what you might have in your pocket. The three front pockets: Buttoned chest pocket, larger zippered pocket and an even larger buttoned pocket. 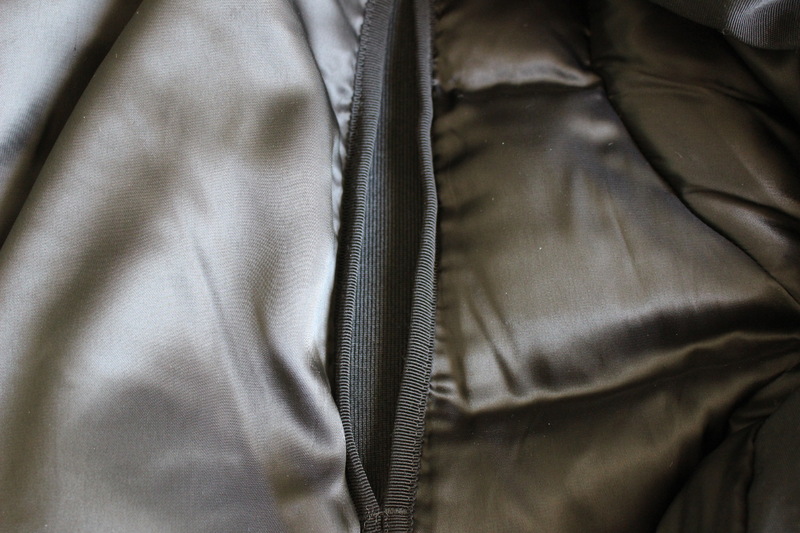 The zips used on the front and arms are quality YKK zips, the front one is bi-directional, so the coat can be worn open from the top or the bottom. The zipped arms make it easy to adjust the arm opening to allow for gloves or ventilation. The front also has snap buttons to close, providing yet another option for wear. Another functional idea taken from traditional utilitarian jackets is the action back. In this case, though the added fold of fabric is solved in a different way. On the outside, all you can see is a slit either side of the back, bordered by carefully bonded waxed fabric. On the inside, it looks quite different, but the result is a back and shoulder construction that allows the shoulders to be flexed and used. Quite the boon when cycling! Outside view of the articulated back to allow for freedom of movement. Inside view of the articulated back that allows for movement. How my experience of using it been? My typical working day starts out with a bike ride to the train station on snowy roads. It’s cold and dark, and windchill is a factor. Once at the station I’m standing around for a while getting cold. Then there’s at least an hour on a hard train seat, a short walk, then half an hour on the tube and finally another walk. Repeat in reverse order to head home. This means that to keep me happy I need to wear something both insulated and windproof. Comfy and practical. And suitable for changing weather conditions. The Serac was perfect for this. The day I realised the zip went further up and the sheepskin collar could fold up to cover my neck was pure bliss. The big front pockets are great for putting gloves, scarf and hat in. The other pockets perfect for phone, wallet, book, some fruit and so forth. Unlike a Swiss-army knife that is a semi-usable collection of terrible tools, the Serac is a very usable total of excellent ideas. Something I did become very aware of though when commuting in the Serac was how uniform Norwegian men are in their choice of coats. You’d think they were dressed to go to a funeral, black coats pretty much all over. Naturally, the Serac allowed me to stealthy blend in, at least colourwise. It did have me wondering though what the T2 would have looked like in different colours, maybe duo colour. What you’re probably really most interested in at this point is: Is it worth the price? And I will freely admit that I would be hard-pressed to come up with an argument to make the case that based on the international market for coats, production variables and a general appreciation of quality it is actually worth the price. Heck, most of my cars have cost less (though granted they were pretty awful). At the end of the day though in a world where it’s not unusual to spend a small fortune on a watch, shoes, cars and sundry luxury items, a Serac actually does seem like something more sensible to spend money on. For me it has worked out very well and ended up being the jacket I have used most of all this winter. Yes, you can find a decent enough coat for a lot less money than this. You can also find crummy jackets for not much less than this. While Serac is certainly a premium brand, I would argue that the technology, design fabrics and workmanship that has gone into this coat is of a level rarely seen in other brands. Could it be improved? I’d love for a technical hood to be included, preferably stashed in a rear pocket, with provision for stowing the collar when the hood is in use. This would double the usage to include days when rain or sleet means a hood would be preferable. A hood that could be really snugged up, yet allows full movement, would be really great. Available now from Serac at 2200 euros.